The radius and ulna are the two long bones of the forearm, below your elbow. This page explains what happens when you break (or fracture) one or both of these bones in the middle. There are separate pages about breaks that happen at the elbow end of these bones or near the wrist. There is also a separate page about what happens when a child breaks these bones. How does a forearm break? A broken forearm usually happens from falling on to an outstretched hand or from swinging arm injuries. Serious accidents, such as car accidents, motorcycle accidents, or falls from a ladder cause more serious breaks. Weak bones (for example, in someone osteoporosis) tend to break more easily. 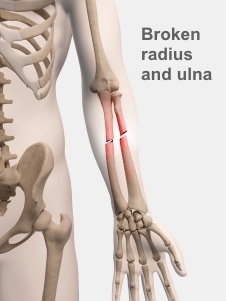 It is common to break both the radius and ulna together. If only one of the bones is broken, it can be harder to diagnose. Your forearm can break in many different ways, and some breaks are worse than others. How bad a break is depends on how many pieces a bone breaks into, whether those pieces are stable or move around a lot, and whether the broken ends of the bone are still in the right place. How do I know if I have broken my forearm? If you have broken your forearm it will be painful and swollen. It may be hard to use your hand or wrist. Your arm may seem to be deformed, because it is swollen or a bone is out of place. You may feel pain just where it is broken, or whenever you move your fingers. Your fingers may tingle or your fingertips may be numb. If you think you may have broken a bone in your forearm it is important to see a doctor or nurse practitioner. They will ask about how your injury happened, look at your hand, and take X-rays to find out which bone is broken and what kind of break it is. They may also X-ray above and below where you are sore, to check if you have any other nearby injuries. You might will also have a CT scan, which can show a complex break more clearly, or an MRI, to show any soft tissue injury. Written by HealthInfo clinical advisers. Endorsed by orthopaedic surgeon, Canterbury DHB. Page created July 2017. OrthoInfo – Adult forearm fracture, retrieved May 2017.